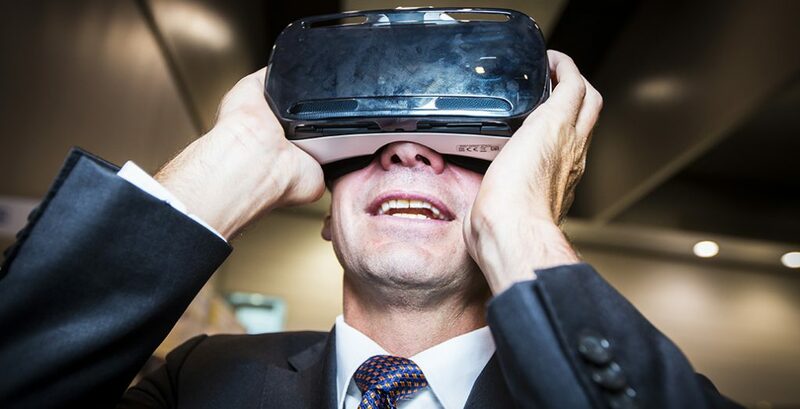 Angus Taylor tests some digital technology for transformative potential at the Locate16 conference in Sydney. Prior to becoming Australia’s Assistant Minister for Cities, Angus Taylor was perhaps best-known for a vocal opposition to wind farms in his rural electorate of Hume. So who is this self-professed country boy and what kind of future does he see for Australia’s cities? Paddy Manning investigates. In fact Taylor, the self-described “conviction politician” plays a straight bat to everything when we meet in the Commonwealth’s swish ministerial offices in Sydney. Taylor refuses to be pigeon-holed. He is the onetime Tony Abbott supporter who says he has “a lot in common” with the current PM. The anti-wind campaigner who is no climate sceptic. The Oxford-trained economist and McKinsey alumni who is no neoliberal. The Liberal party reformer who is no factional warlord. Now, after a chance reshuffle in February, the country boy with the cities portfolio who sees a role for federal government intervention but also thinks “planning has gone too far”. Straight down the middle, every ball. Which smacks more of safe play than conviction… or if the conviction is there, what is it? Whatever his political stripe, Angus Taylor is interesting – the antidote to a parliament full of party hacks. Angus Taylor sees regional centres as being a crucial focus of his cities portfolio. Whatever his political stripe, Angus Taylor is interesting – the antidote to a parliament full of party hacks. Growing up on a sheep and cattle farm in Nimmitabel, near Cooma, rural politics are in his blood. Taylor’s father Peter was a vice-president of the national farmers’ federation and once stood unsuccessfully for the Country Party. But Taylor, now 50, is more landed gentry than cow cocky: a graduate of the elite King’s high school in Parramatta and a Sydney university medallist with first class honours in economics and law, he won the Rhodes Scholarship and did his master’s degree at Oxford’s New College. His 1993 Oxford thesis used game theory to argue that small English pubs should be protected from the major brewers by limiting the number of hotels they could tie up to supply their beer. Perhaps surprisingly for a Liberal, Taylor was “arguing for more regulation, not less”. Returning from Oxford, Taylor volunteered as a staffer for NSW Liberal MP Barry O’Farrell, later Premier, who told him to have a career before politics. So Taylor spent the best part of two decades in management consulting, initially for powerhouse McKinsey, where his older brother worked. Taylor specialised in agriculture and the job took him around the world: highs included playing a key role in the formation of New Zealand dairy giant Fonterra; lows included the launch of an unsuccessful ag supplies dotcom venture, Farmshed, with Wesfarmers. Sick of the travel, and wanting to settle down in Australia, Taylor joined the boutique firm Port Jackson Partners, which counts current ACCC boss Rod Sims as alumni. In 2011, when he decided finally it was time to go into politics, Taylor went back to O’Farrell and, with the blessing of John Howard and Tony Abbott, moved to Goulburn to campaign for preselection for the safe seat of Hume, where long-term member Alby Schultz was due to retire. What comes across, from Taylor’s maiden speech to his press clippings and our lengthy interview, is an interest in nation-building. Married to ANU law lecturer and barrister Louise Clegg, with four teenage kids, Taylor lives on a small property outside Goulburn, at one end of a varied electorate that includes rural, peri-urban and suburban communities, spreading all the way into south-western Sydney – a key battleground for the Turnbull government as it tries to win back Howard’s battlers. What comes across, from Taylor’s maiden speech to his press clippings and our lengthy interview, is an interest in nation-building. Taylor’s grandfather, William Hudson, was chief engineer of the Snowy Mountains Hydro Scheme for almost two decades, which irrigates the Riverina and is still Australia’s largest source of renewable energy. Taylor knows the history of the Snowy scheme intimately, but his enthusiasm for nation-building does not mean he is on a mission to undertake major infrastructure projects. He was a sharp critic of the Rudd government’s National Broadband Network (NBN), our last genuine attempt at nation-building, which has not fared well under the Coalition. Taylor is almost contemptuous, musing: “I’ve always felt there was more to nation building than big bucks. Good projects evolve. The Snowy wasn’t created from a grand master plan on day one, let me tell you, it evolved over time… The idea that you can come up with a nation-building project on the back of a serviette, and then demand that it be done, is just crazy. It’s insane.” Taylor has compared the Snowy and NBN, both government-run projects, and argued only the Snowy was true nation-building because (i) the benefits were properly explained, leading to cross-party support; (ii) the construction brought us together, particularly tens of thousands of immigrants from all over Europe, and (iii) through contracting, the project set new benchmarks for industrial relations (e.g. no smokos) and safety (e.g. seatbelts). It’s a reasoned rather than tabloid critique, although Taylor’s ambivalence about the NBN is confounding coming from the assistant minister responsible for digitising government services and delivering them online. Taylor has written about the potential efficiencies and compliance advantages from integration of central government datasets – although this would no doubt raise “big brother”-type fears for some. Taylor insists he supports the NBN “as it has evolved” and says as a local MP he probably spends more time in his electorate on telecommunications than any other issue. Future PM? 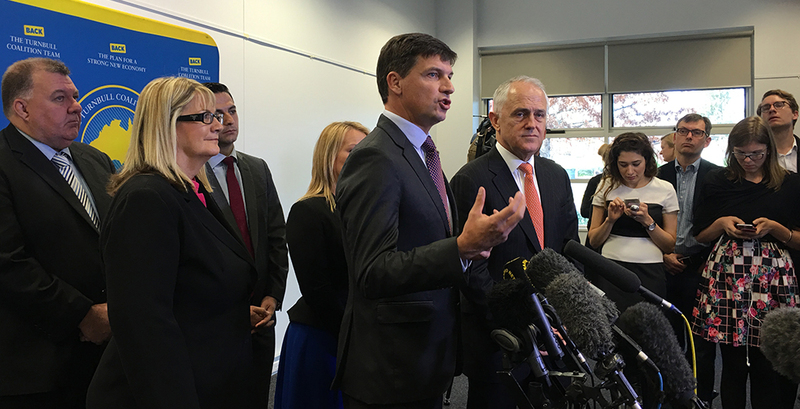 Angus Taylor (c) and Prime Minister Malcolm Turnbull (r) launch a City Deal at Oran Park, NSW. Taylor has no doubt Australia can still do nation-building, only he sees it differently: “Everyone wants to hark back to those old, utility-type projects. I actually think the nation-building projects of the 21st century are our cities. It’s how we build our cities. They are now the economic engines, right? We have a service- and knowledge-driven economy, that’s where the majority of the economic activity is now. Our cities, the way they’re built, the way they’re planned, the way we invest in them, is nation-building.” This is either big-picture stuff, or it’s a series of platitudes… the answer will depend on what Taylor actually does with his portfolio. “I went into politics to have an impact,” Taylor says. “If I think, in whatever I’m doing, I can’t have an impact, I go and do something else. That’s what I get my jollies from. I guess that was part of the McKinsey culture [and] it’s certainly a big part of the Rhodes culture.” As an assistant minister he is perhaps too junior to make much of a difference, and the property industry hopes Taylor and his cities portfolio will be elevated into Cabinet. For Taylor, the shock victory of President-elect Donald Trump has only underscored this growing disconnect between the political and media establishment, concentrated in the inner cities, and the people of the suburbs and regional areas. The question is whether someone as privileged as Taylor can bridge the divide. Recently a number of planners wrote an open letter to the NSW government tackling the furphy that housing supply was the answer to housing affordability. A killer slide showed housing supply had been rising for the past five years, almost in line with house prices. The counter-argument is that it has been the wrong type of supply – especially, too many inner-city apartments built for investors, not families. Taylor has said that the Commonwealth will not be an “Automatic Teller Machine,” but will want a say and a return on its investment. Arguably, the federal government’s anti-planning rhetoric is just a continuation of the blame game, pointing the finger at the States over housing affordability. RMIT University urban policy professor Jago Dodson says that because the Commonwealth has no influence over land-use zoning, that makes it an easy policy to attack, whereas the tax benefits of owner occupation (negative gearing, non-taxation of imputed rents; capital gains exemption) which the Federal government directly controls, “barely register as issues”. Where Professor Dodson does agree with Taylor is on rising inequality. “Australia has semi-deliberately constructed an urban system that is highly regressive in terms of social distribution and access to infrastructure, public services and amenity,” says Dodson. “The transition to a service economy and the re-centralisation of high-value employment means workers in high value jobs are locating in the inner city and getting the advantage of all the existing transport and social infrastructure while less affluent households have been pushed out the edges where employment is scarcer and public amenity is less.” The single biggest policy challenge, says Dodson, is not high-rise apartment blocks nor more land on the fringes, but how to encourage high-quality suburban infill development that does not trigger a community backlash. The main plank of the federal government’s urban policy platform has been the “Smart Cities” policy announced in April, with its linchpin strategy of promoting new “City Deals” between the federal, state and local governments. 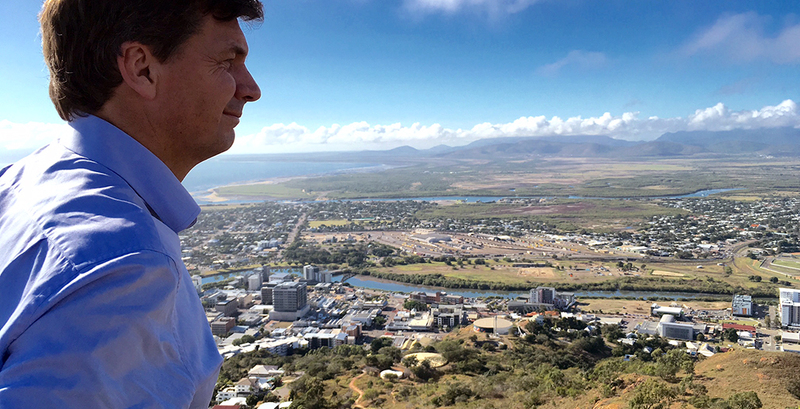 The first, for Townsville, announced during the election campaign, included $100 million for a new football stadium – a pledge that raised a few eyebrows given the Prime Minister had ruled out funding it previously. A deal with Launceston is in the pipeline, as is a Western Sydney deal which will require Taylor to do some hard bargaining with his boss’s wife, Lucy Turnbull, head of the NSW Government’s Greater Sydney Commission. Taylor said he has had “fantastic” meetings with Turnbull, formerly Lord Mayor of Sydney, and describes her approach as “very strategic”. Taylor’s enthusiasm for planning cities is a bit surprising for an attendee of the infamous “Monkey Pod” meetings of despondent Tony Abbott supporters, after his ouster by Turnbull. Conservatives are wary of central planning at the best of times, and their natural respect for state’s rights has meant that in federal politics it has generally been Labor that takes an interest in urban affairs. True to form, Abbott ditched the cities ministry when he took power in 2013, and axed the cities policy unit inside the infrastructure department. Turnbull revived it, inside the department of Prime Minister and Cabinet, where a low-profile unit answers to Taylor. For Taylor, an acceptance of climate science has not translated into support for renewable energy. For Taylor, an acceptance of climate science has not translated into support for renewable energy. Perhaps the best-known public position in his short political career to-date has been to campaign against wind farms. These are hugely controversial in his southern highlands electorate, which has more wind farms proposed than any other electorate in NSW. Taylor’s opposition was sparked in 2003 when a wind farm was built near the original family farm at Nimmitabel. Taylor has turned up at anti-wind rallies, worked on Tony Abbott’s review of the Renewable Energy Target (RET), and used a semi-regular slot on broadcaster Alan Jones’ program to rail against wind energy. Taylor is championed on the rather crazed Stop These Things website, but has not descended into the anti-scientific vitriol that has plagued the wind debate. He does not bang on about infrasound or wind turbine syndrome. Instead, he recognises that wind farms are not universally popular, slams a planning system that allows “industrial wind farms” to be built in rural-residential areas – which he likens to building factories next to homes – and zooms in on the economics of renewable energy. Taylor is nothing if not ambitious, and marked out for higher things, but he has some thorny dilemmas to resolve if he is to reconcile his own thinking with his twin portfolios. Which is very pragmatic for a conviction politician. Taylor is nothing if not ambitious, and marked out for higher things, but he has some thorny dilemmas to resolve if he is to reconcile his own thinking with his twin portfolios: how to plan cities and digitise government without centralising power, and how to do nation-building on a shoestring. Paddy Manning is a writer and journalist who has worked for the ABC, Fairfax, Crikey and the Australian. He is the author of three books, including Born to Rule: The Unauthorised Biography of Malcolm Turnbull.